In the early 1800s, a great battle was said to have taken place in Gaviota between the Native Americans of the area and Spanish soldiers. Although the Native Americans had already marked the graves of their fallen with Indian totems, seashells, etc, Spanish priests later replaced these "headstones" with Christian crosses, granted supposedly out of respect and reverence for the deceased. With more than 100 graves marked thus, the area became known as Las Cruces or The Crosses. 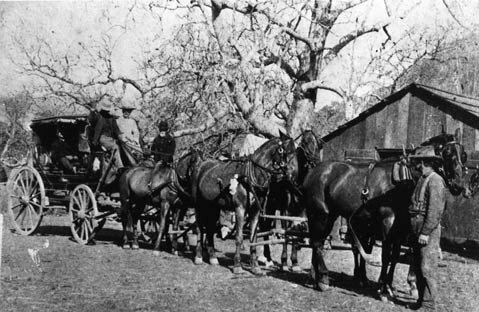 Around 1850, with the area now belonging to California and the United States, the crosses were sadly removed and the area became a stage coach stop. The stage coach stop eventually became a hotel and saloon before becoming a notorious gambling hall and brothel. Over the years, the graves of over 100 Native Americans were lost, now lying unmarked. When the stage coach line closed in 1901, along with the recent railroad expansion in the area, Las Cruces began to decline. It operated briefly as a roadside cafe and gas station in the twenties, but eventually was abandoned, before becoming part of Gaviota State Park in 1967. Very little now remains, basically the remnants of one structure, massively dilapidated, but still barely standing, holding on to what Las Cruces use to be. But ghosts still linger. The apparitions of three prostitutes still ply their trade in the ruins of the old adobe. According to legend, two of them were strangled by an insane customer and the third committed suicide. They appear standing inside the building, oblivious to its current state, apparently still believing the building is a standing brothel. Another ghost, one wearing a knee length black coat and a wide brimmed hat, is said to have been a gunfighter who died in a gun fight on the premises. And, of course, at night the structure is surrounded and haunted by the restless spirits of the Native Americans whose graves still lie unmarked, now strangled with weeds. To find Las Cruces Adobe exit Highway 101 at Route 1, turn left onto San Julian Road. Go down San Julian until you reach a parking lot on your left. There is a trail leading off the parking lot leading to the adobe.